Gandhelu is commonly found in the outer Himalayas, from the Ravi eastwards, ascending to 5,000 feet, in Assam. It is also found in evergreen and deciduous forests of peninsular India, often as underwood. 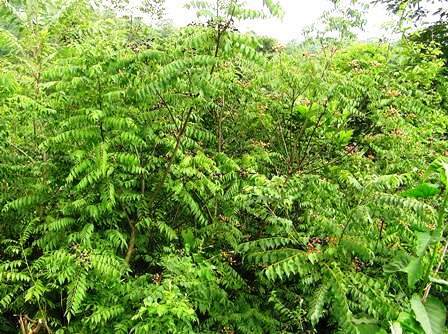 The shrub is of common occurrence in Himachal Pradesh in areas lying between 800 and 1,450 metres above the sea level. Almost every part of this plant has a strong characteristic odour. The people of the plains, particularly of southern India, use the leaves of this plant as a spice in different curry preparations. 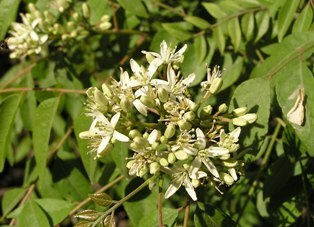 A small spreading shrub, about 2.5 metres high; the main stem, dark green to brownish, with numerous dots on it; its bark can be peeled off longitudinally, exposing the white wood underneath; the girth of the main stem is 16 cm. Leaves, exstipulate, bipinnately compound, 30 cm long, each bearing 24 leaflets, having reticulate venation; leaflets, lanceolate, 4.9 cm long, 1.8 cm broad, having 0.5-cm-long petiole. Flowers, bisexual, white, funnel-shaped, sweetly scented, stalked, complete, ebracteate, regular, actinomorphic, pentamerous, hypogynous, the average diameter of a fully opened flower being 1.12 cm; inflorescence, a terminal cyme, each bearing 60 to 90 flowers; calyx, 5-lobed, persistent, inferior, green; corolla, white, polypetalous, inferior, with 5 petals, lanceolate; length, 5 mm; androecium, polyandrous, inferior, with 10 stamens, dorsifixed, arranged into circles of five each; smaller stamens, 4 mm. long whereas the longer ones, 5 to 6 mm; gynoecium, 5 to 6 mm long; stigma, bright, sticky; style, short; ovary, superior. Fruits, round to oblong, 1.4 to 1.6 cm long, 1 to 1.2 cm in diameter; weight, 880 mg; volume, 895 microlitres; fully ripe fruits, black with a very shining surface; pulp, Wistaria blue 640/2; the number of fruits per cluster varying from 32 to 80. Seed, one in each fruit, 11 mm long, 8 mm in diameter, colour spinach green 0960/3; weight, 445 mg; volume, 460 microlitres. Flowering starts from the middle of April and ends in the middle of May. The peak flowering season under the Sanwara (H.P.) conditions was observed to be the last week of April. The fruiting season was observed to continue from the middle of July to the end of August. The peak fruiting season, however, was found to continue from the last week of July to the 1st week of August. The average yield of a medium-sized bush was found to be 480 g in three to four pickings. The pulp of the fruit contains 64.9 per cent moisture. The content of total soluble solids of the fruit juice is 16.8 per cent. The pulp contains 9.76 per cent total sugars, 9.58 per cent reducing sugars, 0.17 percent non-reducing sugars and almost a negligible amount of tannins and acidity. The vitamin C content of the fruit, which is 13.35 mg per 100 g of the pulp, is better than that of many fruits studied during the course of the present investigation. The mineral content of the edible portion of the fruit, as represented by its ash, is 2.162 per cent. Similarly, 100 g of the edible portion of the fruit contains, protein, 1.97 g; phosphorus, 0.082 g, potassium, 0.811 g, calcium, 0.166 g; magnesium, 0.216 g; and iron, 0.007 g.
The leaves, the bark and the roots of Murraya koenigii (L.) Spreng. can be used as a tonic and a stomachic. The bark and the roots are used as a stimulant by the physicians. They are also used externally to cure eruptions and the bites of poisonous animals. The green leaves are stated to be eaten raw for curing dysentery, and the infusion of the washed leaves stops vomiting. A strong odiferous oil occurs in the leaves and the seeds of Gandhelu plants. The chemical examination of this oil indicated that this essential oil exhibited a strong antibacterial and antifungal activity. An alkaloid, murrayacinine, is also found in this plant. The major part of the fruit is occupied by the seed and the edible portion is only 49.4 per cent of the whole fruit. The fruits are very sweet and are eaten fresh. They have a characteristic odour which makes them slightly unpleasant. The overall fruit quality is fair. 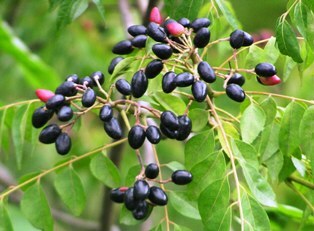 The shiny-black fruits are liked both by children and adults. As revealed by the chemical composition of the fruits, they are very nutritious. These fruits have also many medicinal properties. Leaves are used as a spice in different curries and impart a characteristic flavour to the preparations. The branches of this plant are very popular for cleaning the teeth as datun and are said to strengthen the gums and the teeth. This plant is quite ornamental due to its compound leaves. It can, therefore, be used as a hedge and as an ornamental shrub.